A regional publisher has defended its coverage of a leading Championship football club despite a former daily news editor’s claims there was no local media presence at the team’s opening game of the season. Jim Levack, formerly of the Birmingham Mail and Coventry Telegraph, has attacked Reach plc in an article for Beesotted, a fanzine for supporters of Brentford FC. 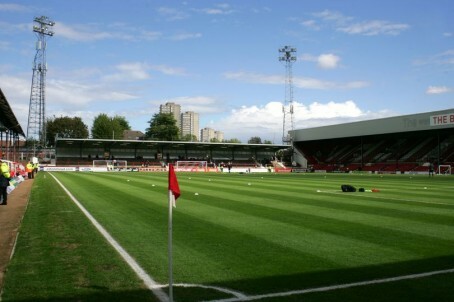 In his piece, Jim claimed there had been no local media representation at Brentford’s Griffin Park stadium, pictured, on Saturday for the first time in the club’s professional league existence. But Reach has hit back at Jim’s claims, saying it is now bringing its coverage of the club to “a bigger audience than ever before”. Brentford defeated Rotherham United 5-1 to put them top of the Championship, English football’s second division, after the opening round of matches. “Fair enough, the need to fill column inches in print probably isn’t as great these days with online presence far more important, but to not send a reporter to the game is a disgrace. Trinity Mirror, owners of the [Hounslow] Chronicle for which I was proud to work for almost two decades, have pulled the plug on anything worthwhile journalistically… and it breaks my heart. “Their sole contribution to covering the Rotherham curtain raiser was a live Twitter stream which they presumably took from the excellent ifollow coverage. If supporters unable to make the game want that, the club and Beesotted do it already. Jim, who was news editor at the Telegraph from 1993 to 2000 before spending eight years in the same role at the Mail, went on to contrast current local media coverage with the days of former Hounslow Chronicle editor George Sands, who attended a total of 1,126 uninterrupted Brentford games between December 1953 and May 1976. He added: “I’m a great believer in accountability and genuinely feel that had there been a strong local media presence in Kensington, the views of the families living in Grenfell Tower whose pleas for help fell on deaf ears would have been picked up and taken higher. Football clearly isn’t as important as life and death despite what [legendary Liverpool FC manager Bill] Shankly once said, but it’s a terrible shame that the once vital local reporter no longer exists at Griffin Park. “We are lucky that a decent number of the national media or agency staff who come along week in, week out have a soft spot for the club and do a great, professional job. Reach has countered that it provided four separate pieces of coverage on the match via its capital-wide football news website Football.London. This included a blog providing live goal updates from Brentford’s match, as well as games involving fellow London clubs AFC Wimbledon, Millwall and Queens Park Rangers. A spokesman said: “The opinions shared in the article are simply not supported by the facts. Brentford’s opening match against Rotherham was covered comprehensively with four separate pieces of coverage – a full transcript of the managers press conference ahead of the game, a live blog during the match, a write-up of the match highlights, and an analysis of player ratings. HTFP has asked for further clarification on whether a reporter was physically present at Griffin Park but Reach has yet to respond. Reach/Trinity just don’t get it do they. They have a vision of what they want to be but they just don’t come anywhere close to doing it as well as all the established brands that are out there. All the while why they chase that dream they have completely turned their backs on everything they did well locally. My head is firmly out of the sand and I understand the landscape we now find ourselves in but I also understand poor quality reporting, poor web sites and turning your back on what you are meant to be, a local media business, will only advance the demise of the industry. Laughable. Reach could have had one of their other reporters cover the pre-match press conference, but as for the other stuff, well such is technology these days I could have done it from home. The crucial point is Reach haven’t mentioned anything about post-match quotes. Can’t think why. It’s the same on my own patch, county cricket and Premiership rugby are rarely staffed by Reach, and even when they do, they refuse to put the content on their website (for reasons which baffle even their own staff). A transcript of a press release? Wow. That’ll have been emailed to the desk anyway. Presumably the rest was mostly cobbled together from BBC content, especially the live scores. ‘The opinions shared in the article are simply not supported by the facts’. The live blog featured all their local clubs, with Brentford’s sole presence being the mention of goals. That’s it. The match report was two pars. Yes two pars. For a match report. True, there is a man of the match, obviously given to the striker who scored twice. The only ratings are supplied by supporters – with the website asking readers to submit their numbers. So, all in all, clearly nobody from Reach was actually at the Brentford game – and a home game at that. I think it can safely be assumed that (out of)REACH did not have a reporter at the match. Why try to fool the public? If they are too skint to pay someone to cover it so be it. But don’t try to pretend they are giving full coverage. By the way this is not restricted to REACH. A lot of senior clubs do not see a professional reporter from a newspaper and have to send their own (unbiased of course) reports. Send a reporter to a football match? How quaint. Far more important to send them to the opening of the newest MacDonald’s or any other envelope which might get a few more clicks. Neil Allen is spot on. A call to Brentford FC to ask who attended the game would end the debate once and for all. Notwithstanding the Reach statement the two pars of match report they did muster included the howlers…. Reach Out, I’ll be there (or not in this case). Whatever retch says, it doesn’t wash. I would like to point out that, in contrast to some of what is being said here, the Rotherham Advertiser sent a reporter and a photographer on the 330 mile return journey and will do so to every away game as we still believe it is vital to provide comprehensive coverage for fans who can’t get to games. Some people do still want to read – in print – about their teams. Glaring in Reach PLC’s statement, the word reporter is never used. Therefore from their own self congratulatory statement, it would seem their coverage of the game was provided by the club, the team’s PR, or a keen fan, we can assume. Andrew mosley. That’s heartening to hear. Fans like to read an independent report not some puff from the club about how desperately unlucky they were to lose 6-0 or whatever.